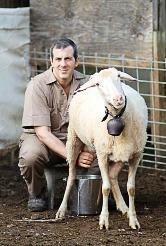 Karras Farm is a fourth generation dairy sheep farm, originating over centuries ago in the country of Greece. Andy Karras, owner and operator of Karras Farm has blossomed and carried the dairy sheep industry strongly and far from his great-great ancestry, now continuing the passion of dairy sheep farming in the United States. Andy has followed in the footsteps of his father, grandfather, and uncles learning from a small boy the job of raising dairy sheep. His family members had sheep as their sole income to raise their families and taught Andy knowledge in raising dairy sheep. Andy grew up with dairy sheep passion deeply in his veins. He went to Greece and received his doctrine in Veterinarian Science along while spending his days and nights on a dairy sheep farm getting hands on experience. Andy Karras has since brought his company, Karras Farm, to a world-renown name for producing some of the highest-quality dairy sheep genetics in North America from the East Friesian Dairy breed, to the new and improved Awassi Dairy Sheep and the Assaf Dairy Sheep. With Andy’s hard work and dedication, his vision is to continue to boost the American Dairy Sheep Industry here in North America to become the top producer in diary sheep products from cheeses, to milk, yogurts to decrease on importation from other countries. He continues everyday to help small homestead farms to large incorporated dairies getting started with strong milking herds of sheep. He also carries a strong name of furthering his duties into helping the dairy farmer to make sure from the time of delivery to everyday on out, that the sheep thrive to do the best job for its Shepard. Karras Farm is the leader in dairy sheep genetics in the US. He is backed by his proof in his animals and knowledge of helping grow and keep up with the growth and demand in the US dairy sheep industry and now in other countries. Karras Farm is continuing to help so many around the world in raising sheep, and is also looking forward to bringing in new dairy sheep genetics to constantly boost the demand here in North America.